If you're a fan of Christmas trivia, this article will help you brush up on Father Christmas history. 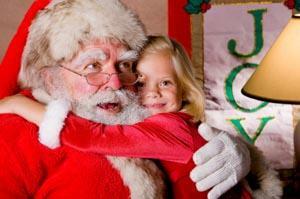 Although most people use the names "Father Christmas" and "Santa Claus" interchangeably, the two characters have historically different identities. Father Christmas is thought to have originated as a character belonging to part of an old English winter festival who was a sign of the returning spring. He would go from door to door in a neighborhood and feast with each family as a sign of goodwill. It is interesting to note that the first stories of Father Christmas do not portray him as bringing gifts or being associated with helping children to enjoy the Christmas holiday. It was not until the Victorian Era when stories of Santa and characters known as Sir Christmas, Lord Christmas, and Old Father Christmas began to merge that Father Christmas gained the reputation he enjoys today. His eyes -- how they twinkled! His dimples -- how merry! While Father Christmas is often portrayed in modern illustrations wearing a red coat, this dressing style appears to have developed in the 1930s. Before then, Father Christmas was most often shown wearing green. It is speculated that Coca-Cola's extensive advertising campaigns were the reason for the change. France and French Canada - "Père Noël"
Ireland - "Daidí na Nollag"
Mexico - "El Niñito Dios"
If you're fascinated by Father Christmas history, you may want to pick up a copy of Letters from Father Christmas. This charming children's book was written and illustrated by J. R. R. Tolkien between 1920 and 1942. An English writer, poet, and professor, J. R. R. Tolkien is best known as the author of the fantasy classics The Hobbit and The Lord of the Rings.Letters from Father Christmas consists of various responses J. R. R. Tolkien prepared to answer letters his children wrote to Father Christmas each year. Whimsical characters such as elves, goblins, a snowman gardener, and a polar bear who acts as Santa's assistant add a charming touch to each tale. The book was first released in 1976. It was edited by Baillie Tolkien, the second wife of J. R. R. Tolkien's youngest son Christopher Tolkien. Since then, however, several different editions have been created to keep up with demand for the story.